Each box contains 30 Capsules, a one-month supply. Each vegan capsule has 119 milligrams of our patented high absorption enzyme fermented ginseng extract. The capsules can be separated individually from the 10-pack to take with you in a purse or pocket. 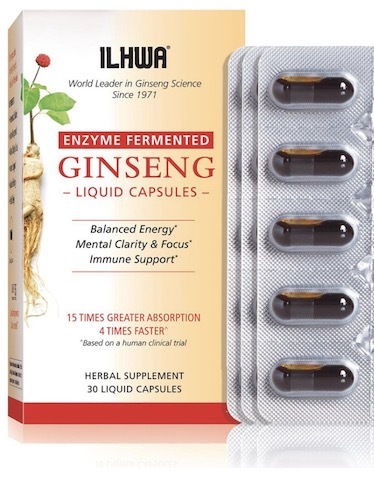 Enzyme Fermented Ginseng capsules are completely safe and non-toxic, supporting your body to achieve homeostatic balance and manage the adverse effects of stress. When your stress levels are high, additional capsules can be taken. With continuous daily use, expect to experience smooth and sustained energy, increased mental clarity and improved mood. ILHWA Fermented Ginseng also promotes deep restorative sleep when taken just before bed. Directions: Take one capsule in the AM. More capsules can be taken in the PM as needed or recommended by your healthcare professional. Best taken on an empty stomach. Dissolve capsule under tongue and/or swallow with water. Warning: If you are pregnant, nursing or taking any medications, consult your doctor before use. Keep out of reach of children. Store in a cool, dry place away from direct sunlight. Do not use if outer seal is missing.